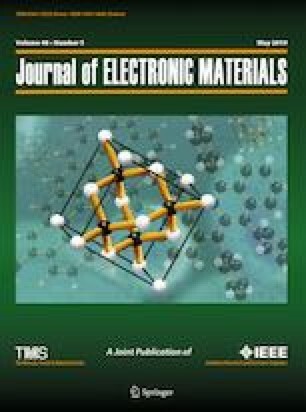 The Hall effect and thermoelectric properties of impurity-doped semiconducting Mg2Sn, fabricated using a process combining chemical reduction and spark plasma sintering, were investigated. A small amount of the oxides, hydroxide, or carbonate of IA, IIIA, IB, IIIB, and VB group elements [Al2O3, Bi2O3, Sb2O3, La(OH)3, Li2CO3, Ag2O, CuO, Ga2O3, In2O3, Na2CO3, or Y2O3] were added to improve the thermoelectric performance of Mg2Sn. X-ray diffraction was used for phase identification, and the patterns revealed that the major phase was cubic Mg2Sn, while the minor phases were orthorhombic and trigonal Mg2Sn, MgO, Sn, and intermetallics obtained by the chemical reduction of the additives. The doping of Bi, Sb, Li, Na, and Ga elements into Mg2Sn was found to significantly affect the carrier transport properties. The maximum values of the dimensionless thermoelectric figure-of-merit (ZT) for the p-type Mg2Sn fabricated using Li2CO3 and Na2O3 were 0.25 at 674 K and 0.11 at 577 K, respectively. However, the ZT values for the n-type Mg2Sn fabricated using Bi2O3 and Sb2O3 were 0.057 at 476 K and 0.058 at 574 K, respectively. This research was partially supported by Grants-in-Aid for Scientific Research (C) (Nos. 15K06520 and 18K04791) from the Ministry of Education, Sports, and Culture, Science and Technology (MEXT), Japan.